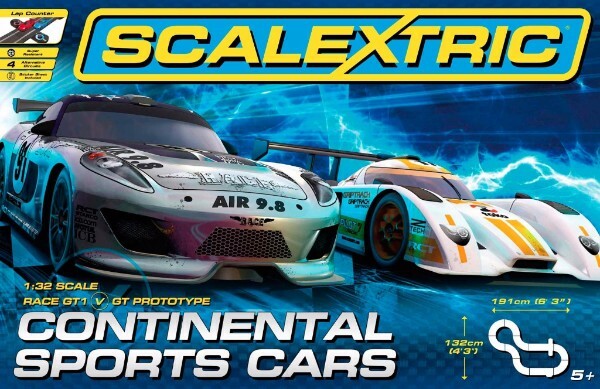 Scalextric C1319TGT40 Continental Sports Cars set PLUS two Ford GT40 cars. A $224.93 value on sale for $199.99! Scalextric C2917 Ford GT40 Mk II, LeMans 1966 This Ford GT40 Mk. II was driven at LeMans in 1966 by one of the most famous F1 and sports car drivers of the era, Graham Hill. This model of the car pays tribute to the driving ace with a driver figure likeness of the man himself complete with his trademark moustache. This Ford GT40 Mk. II was driven at the Daytona 24 Hour race in 1966 by Walt Hansgen and Mark Donohue. 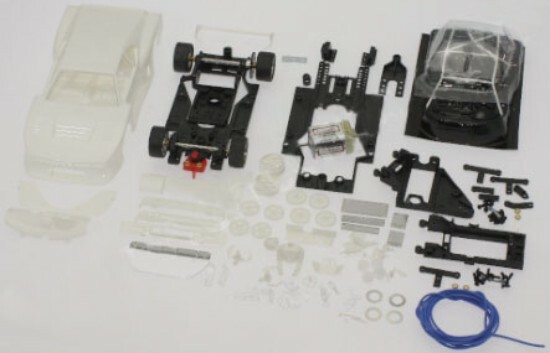 This 1/32nd scale racing kit comes unassembled with everything you need for a working car. Ronnie Peterson raced this Lotus 72 with the number 2 at most of the 1973 Formula 1 races. He finished third in the Championship. François Cevert win the 1971 U.S. Grand Prix at Watkins Glen in this number 9 Tyrrell 002 Ford. He finished third in the Championship. The Sideways cars are some of the fastest you can buy and the limited edition cars are highly collectible. We just received a few of the two newest cars. Sideways HC02 Capri Zakspeed Gp5 “Gold Leaf’ Jochen Rindt Tribute Limited Edition. The original “Pink Pig” deco was applied to the Porsche 917/20 driven by Willy Kauhsen and Reinhold Joest at the 1971 Le Mans 24h Hour race in 1971. Sideways has applied that livery to the second in their series of “tribute” limited edition cars. 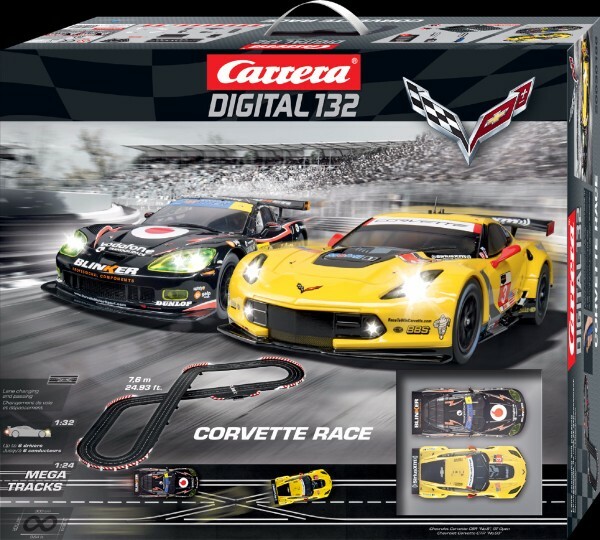 Race two new Corvettes bumper-to-bumper in either or both lanes of this massive Carrera Digital 132 track. The Corvettes have operating headlights, tail lights and brake lights. 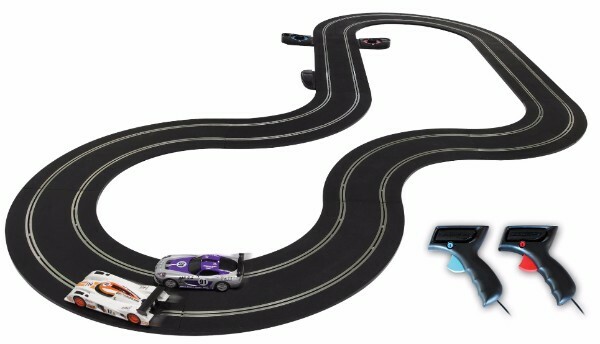 Race the fastest ‘Vettes, head-to-head, on either lane of a twisty road racing track with a figure 8 overpass. 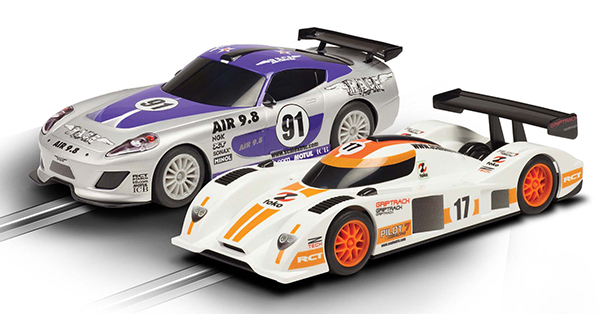 The NSR Porsche 917s and Vettes are some of the most popular cars they offer and new ones are coming for Christmas. 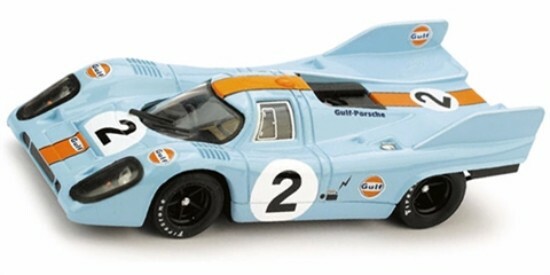 NSR 0003SW Porsche 917K “Double Fin” GULF Livery #2 1971—PRE-ORDER NOW! NSR NSR0006SW Corvette C6R “No Prisoners” RED Test Car SW—PRE-ORDER NOW! NSR 1/32 Analog RTR Corvette C6R “No Prisoners” RED Test Car SW – Adjustable front axle ride height – Drop Arm type Guide Flag with Screw to Allow Fixed Position – Setscrew Aluminum wheels all around – Clear Coat Finish over paint & Tampo printing for maximum durability & Gloss – Sidewinder Shark Motor 25,000 RPM & 176g-cm torque – Ultra smooth and quiet all metal gearing – Heat treated axles with self lubricating bushings – Neodymium traction magnet – Includes the EVO 2 Chassis that will accept Inline / Anglewinder and Sidewinder Triangular motor pods. 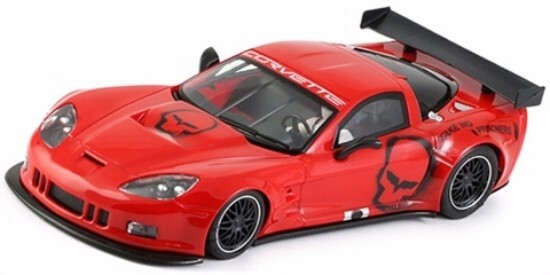 NSR NSR0006AW Corvette C6R “No Prisoners” RED Test Car AW—PRE-ORDER NOW! NSR 1/32 Analog RTR Corvette C6R “No Prisoners” RED Test Car AW – Adjustable front axle ride height – Drop Arm type Guide Flag with Screw to Allow Fixed Position – Setscrew Aluminum wheels all around – Clear Coat Finish over paint & Tampo printing for maximum durability & Gloss – Anglewinder Balanced King Motor 21,400 RPM & 350 g-cm Torque – Ultra smooth and quiet all metal gearing – Heat treated axles with self lubricating bushings – Neodymium traction magnet – Includes the EVO 2 Chassis that will accept Inline / Anglewinder and Sidewinder Triangular motor pods. 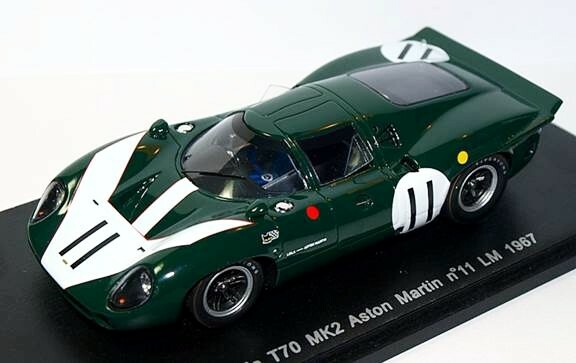 New Proto Slot Kit ready-to-race models and painted body kits for the 1967 Lola Aston Martin LeMans that was the “prototype” for the 1968 Lola T70 MkIII coupe. A rare and beautiful hand-made model. PSK035-rtr Lola Aston Martin, LeMans 1967 ready-to-race—PRE-ORDER NOW! PSK035-rtr Lola Aston Martin, LeMans 1967, dnf, drivers John Surtees and David Hobbs. The car qualified 13th but the engine blew in the first hour. 1/32 scale painted hand-made cast-resin body with Proto Slot Kit KY01 metal chassis, ready to race. Superb quality and detail. Made in France. Proto Slot CB095PK Lola Aston Martin, LeMans 1967—PAINTED BODY KIT. 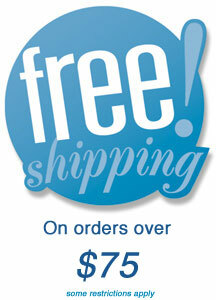 —PRE-ORDER NOW! CB095PK Lola Aston Martin, LeMans 1967, dnf, drivers John Surtees and David Hobbs. The car qualified 13th but the engine blew in the first hour. —PAINTED BODY KIT. 1/32 scale painted hand-made cast-resin body kit. Superb quality and detail. Made in France. Pictures show fully assembled car. The body is designed to fit the Proto Slot Kit KY01 chassis with SR-06 tires and wheels but can be used with many different chassis. ?NOTE: The body in this kit is painted in the overall body color. Kit will require additional painting to complete as shown.